I wanted to get out shooting, but visiting the same old spots just didn’t excite me anymore. I was in a rut. I needed to get out though, get out and capture more stock images. I had a window of one afternoon and an evening in which to get some meaningful shots, so I had to put the old thinking cap on. I know that often once I make the move and get out then often that is the hardest part over. So that’s the first thing I did. Even though I wasn’t feeling it. I also wanted to shoot something that was going to be interesting to me. 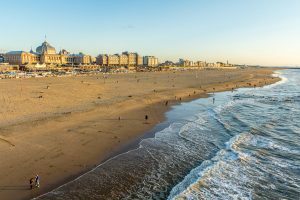 The nearby seaside resort of Scheveningen came to mind as a possible location. I remember going to Scheveningen when I first came to the Netherlands and just hated it. The built up boulevard seemed alien to this boy from Tasmania, who associated the seaside with nature and wildlife rather than hordes of people and attractions. 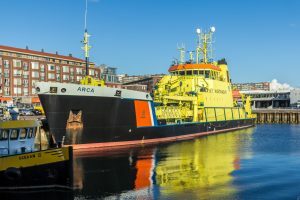 Over the years I’ve changed though, and Scheveningen represented an interesting mix of fun sights and interesting land and waterscapes, albeit, man made. I started with the fishing fleets in the enclosed harbour and and began my photographic hunting expedition. Right away, I knew I had made the right choice. The day was an absolute stunner, with puffy clouds drifting across a deep blue sky. I wandered around the harbour capturing the boats and ships and moved toward the beach. The North Sea coast of the Netherlands stretches north and south for miles. 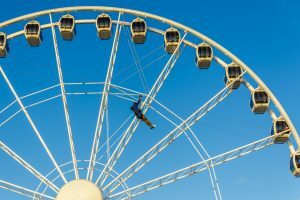 the day was so clear I was able to see the wide sandy beach all the way to Hoek van Holland near Rotterdam and north to the Pier and ferris wheel at Scheveningen resort. Between where I was standing at the south end were a myriad of photo opportunities suh as, beach goers, beach tent cafes, sculptures, a lighthouse, grand hotels and historic architecture. Scheveningen beach southern view shot from the pier. 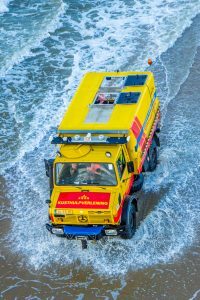 Dutch lifesaver Unimog vehicle on patrol. By the time I had walked the beach to the pier and photographed all there was to offer, five hours had flown by without me realizing, and I was walking back to the car in the dark, and I hadn’t even photographed everything on my shot list. I really can’t wait to go back. 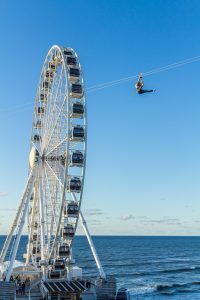 Zip liners going past Scheveningen ferris wheel. I didn’t have time to shoot the light house with its rotating beam or the world war two bunkers that line the high dunes on the north side of the beach after the pier. That will be for another day and will motivate and inspire me to get out shooting. I’ve climbed out of the rut! 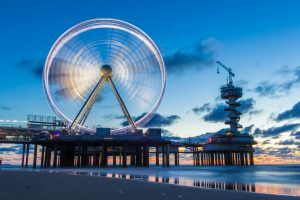 Scheveningen ferris wheel at blue hour before dark on long exposure.